This Crash Course in Home Performance is intended to quickly and thoroughly get any homeowner or building professional unfamiliar with measured home performance up to speed, to prepare for home improvements or new construction that will incorporate controls for invisible dynamics of physics and chemistry. Corbett and Grace created a resource-rich 4-module online video course for anyone who wants more knowledge about home performance. Hours of custom training for homeowners and uninitiated building pros, with exclusive, in-depth video presentations on the entire scope of home performance you can use to make any home healthier, safer, and more comfortable. You also get dozens of additional resources for extra credit, and downloadable resources and worksheets for putting your new talents to work. 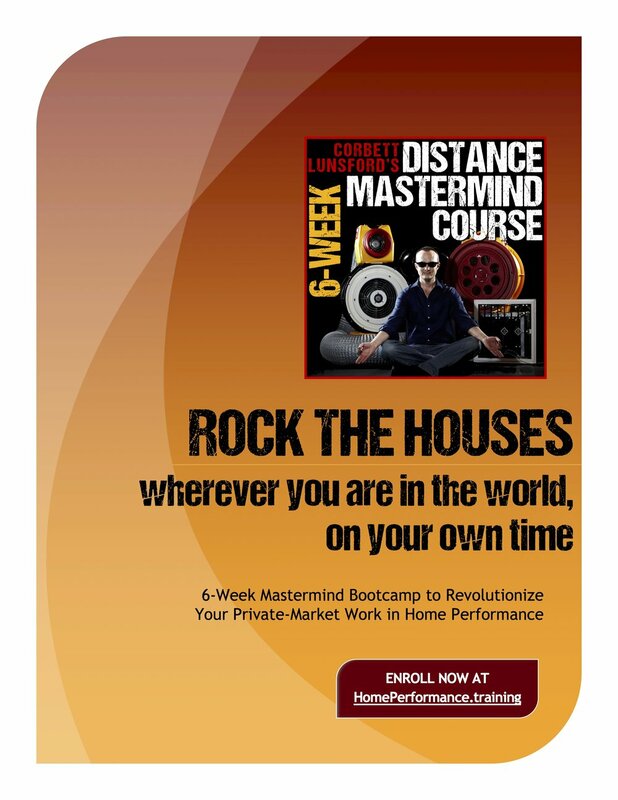 THIS MASTERMIND COURSE IS DIFFERENT THAN ANY OTHER PRO TRAINING YOU'VE PURSUED. "Paradigm shifting training. Excellent form and function. Corbett your passion is contagious. I look forward to developing a Rock Star building performance business. Thanks."